Our ideal recipe for a summer or fall Canadian road trip is to load our small camper van and head for the Gaspé, that eastern peninsula of Quebec just south of the mighty St. Lawrence River and north of New Brunswick. It was a little less than a thousand kilometres to do the circle, following Route 132, immersing our senses in the place where land meets sea. As we approached the far eastern regions of the Gaspé, the landscape shifted from the gentle roll of farmlands and small fishing villages to the (at times) rollercoaster-like hills of The Haute-Gaspésie, before spilling into the breathtaking Land’s End region, best known for landmarks Forillon National Park and Percé Rock (above). Cap des Rosiers is the tallest lighthouse in Canada. The St. Lawrence River can be tempestuous when it comes to weather and challenging to navigate, making the dozens of lighthouses along the route crucial sentinels of the sea. 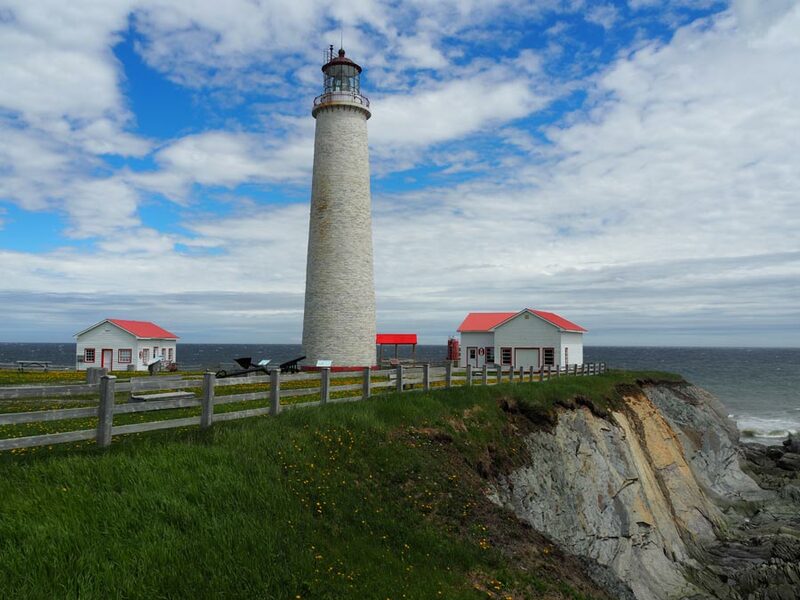 There’s an official Lighthouse Trail with nine Gaspé sites open to the public. We stopped at Cap-des-Rosiers Lightstation, just before the north entrance to Forillon National Park. 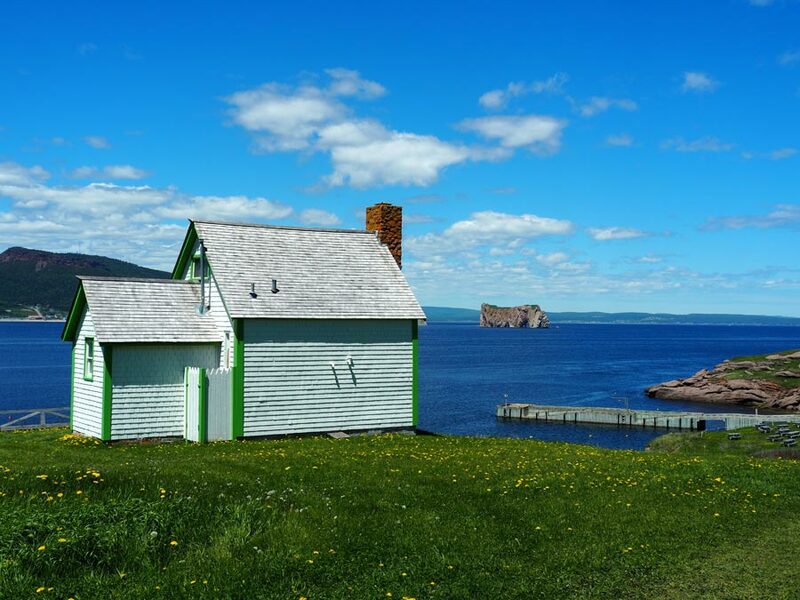 This was the first lightstation in the Gaspé – and the tallest in Canada – now a National Historic Site at the edge of the village named by explorer Samuel de Champlain. Built in the mid-1800s, the burners to power the beacon were first fuelled by whale oil, then petrol and now electricity. However, the original polished glass lens from France is still in use. Land’s End is the treasure trove at the midpoint of a beautiful driving route. The Parks Canada site – Forillon National Park – is known for hiking trails, wildlife, scenic views, coastal sea kayaking and historic sites. We indulged a little bit of everything. View of the cliffs where land meats ocean at Cap Bon Ami in Forillon National Park. Forillon itself is a smaller peninsula, with the north shore jutting out into the Gulf of St. Lawrence and the southern shoreline facing the more moderate Gaspé Bay. We began by looking for “dramatic” and found it quickly where the northern road ends at Cap-Bon-Ami. The coastline of 375-million-year-old cliffs marks the terminus of the Appalachian Mountain chain as it dips into the salty waters. It’s a haven for seabirds that swoop and swirl above. We watched for an hour – from a safe distance – as a mama bear and her two cubs nibbled the grasses and flowers along the walkway by the water’s edge. 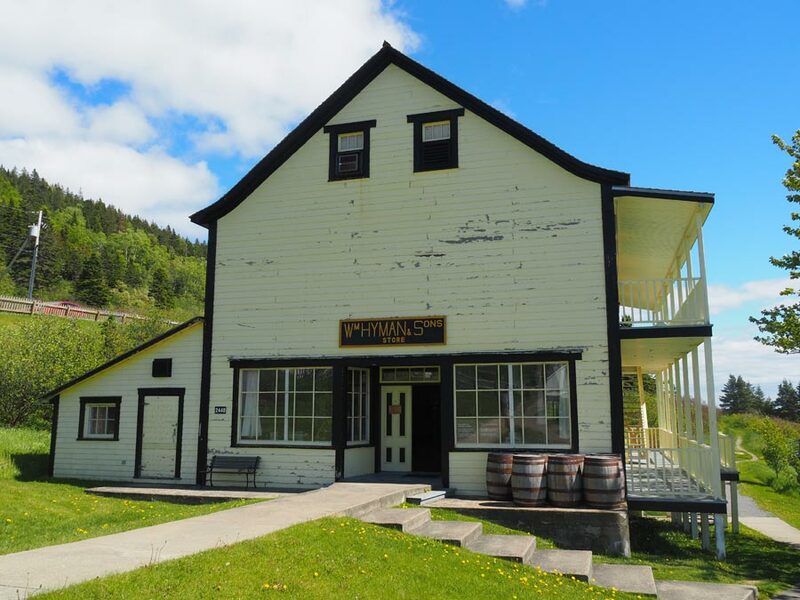 The Hyman Sons General Store in Forillon National Park tells of a time when cod fishing was king along the Gaspe. Touches of history and civilization have been preserved at park sites like Hyman & Sons General Store, a restored shop that served the area’s golden era of cod fishing. Shelves are stacked with the necessities of the day: buttons, rope, fabric bolts, boots and canned goods. It was cod that first brought settlers to the Gaspé and a display leads visitors through the seasonal work faced by the cod fishing families. Sea kayaking along the shoreline of Gaspe Bay with Cap Aventure outfitters. 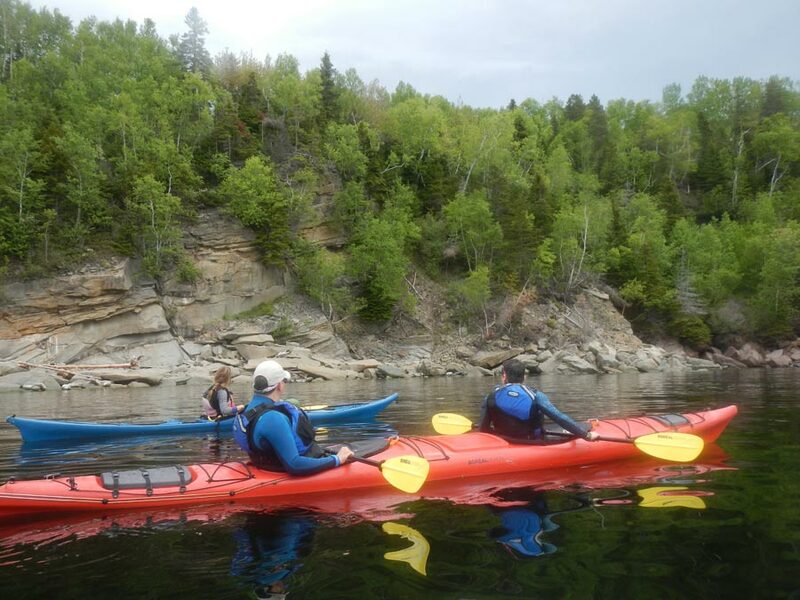 The next day was an early start with Cap Aventure, a sea kayaking outfitter who led our small group of dual kayaks along the rocky shoreline of Gaspé Bay, in search of harbour sea colonies. Roxane, our bilingual guide, was safety conscious as well as environmentally mindful, making sure we stayed a respectable distance from the wildlife. We were treated to a chorus of seals barking, the sight of them playing in the water and lazing on the warm slabs of shoreline rock. Detail of one of the cast iron sculptures at Musee de la Gaspesie marking the arrival of explorer Jacques Cartier in 1534. Leaving Forillon was . . . bittersweet. We could have stayed for weeks, exploring hiking trails like La Chute and Les Graves, which ends at Cap- Gaspé lighthouse. But we pushed on to the wonderful Musée de la Gaspésie in the town of Gaspé. 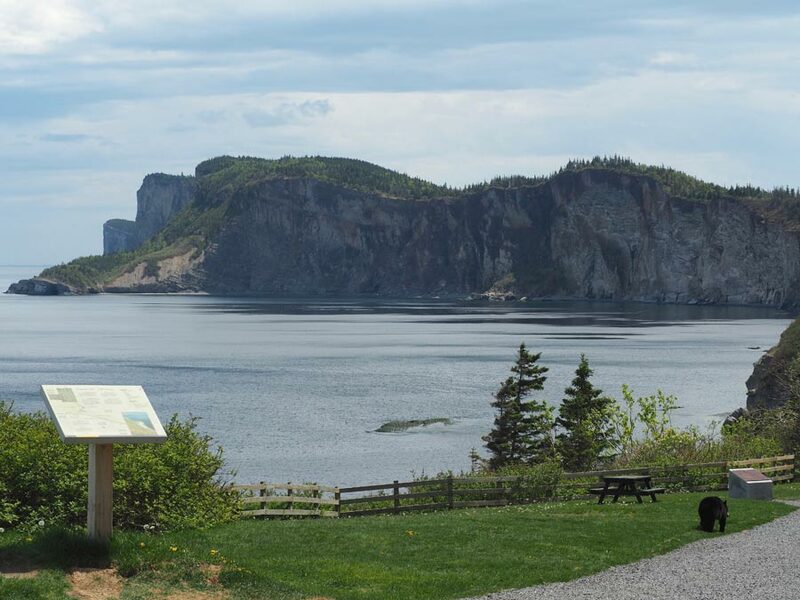 This excellent museum showcases the maritime history of the Gaspé, through a 3D film experience, interactive exhibits, detailed models and tributes to historical players. 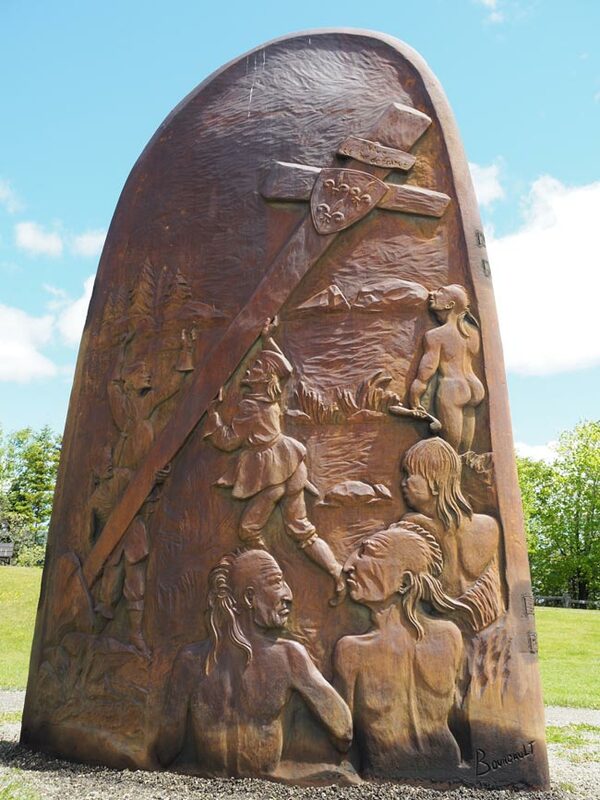 Jacques Cartier was the first European to sail into Gaspé Bay in 1534, where he erected a wooden cross to take possession of the territory for the King of France. This signalled the founding of New France, the French empire in North America. View from L’lle Bonaventure toward Perce Rock. There was one more rollercoaster-like hill that dipped into the village of Percé, a village renowned for its breathtaking chunk of 400-million-year-old limestone (rising from the sea and pierced with a large opening), its lobster catch, the nearby L’Île-Bonaventure and, perhaps not as well known, the seedling ground for the FLQ. Compact and easily walkable, Percé’s waterfront main street is a mix of artisan shops, patios, bistros and seafood eateries. Seafood at La Maison du Pecheur in the village of Perce. 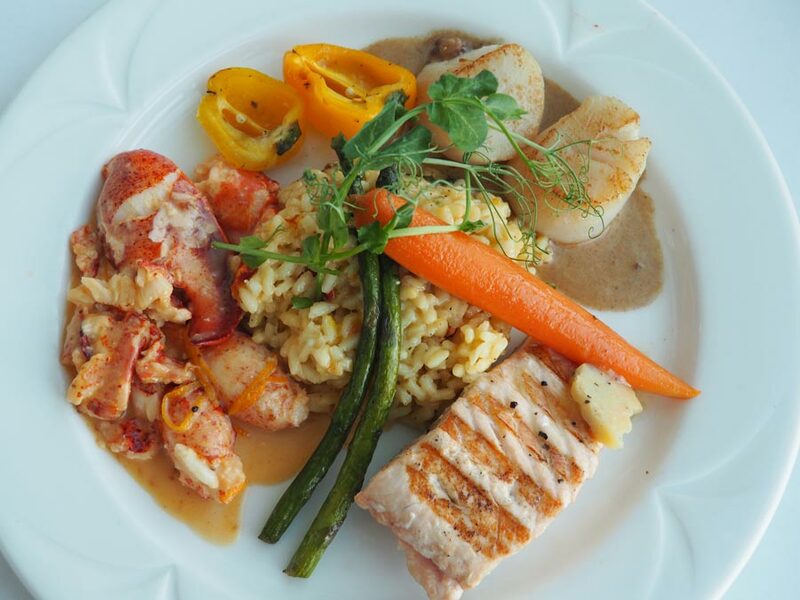 We had the best meal of our trip at La Maison du Pêcheur, where it was impossible to say no to fresh-caught lobster, enormous sea scallops, salmon and Arctic char. 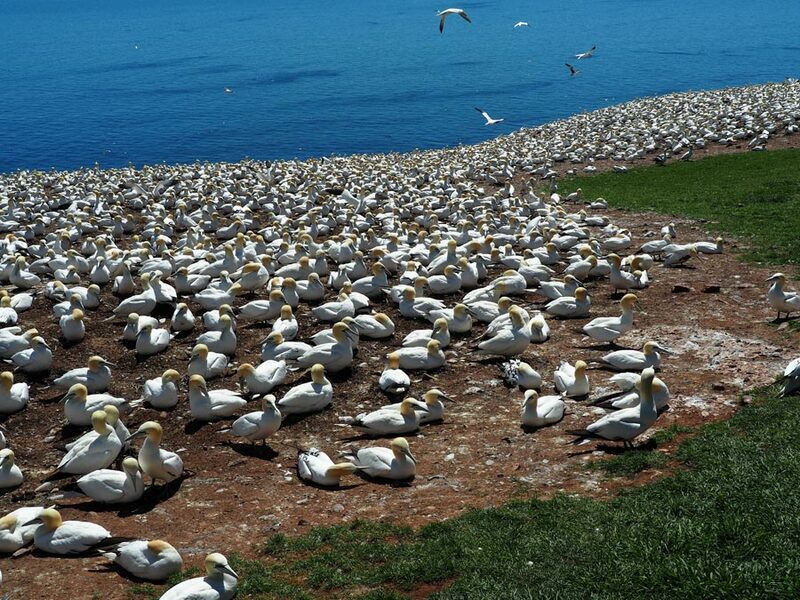 L’lle Bonaventure has the largest colony of Northern gannets in North America. 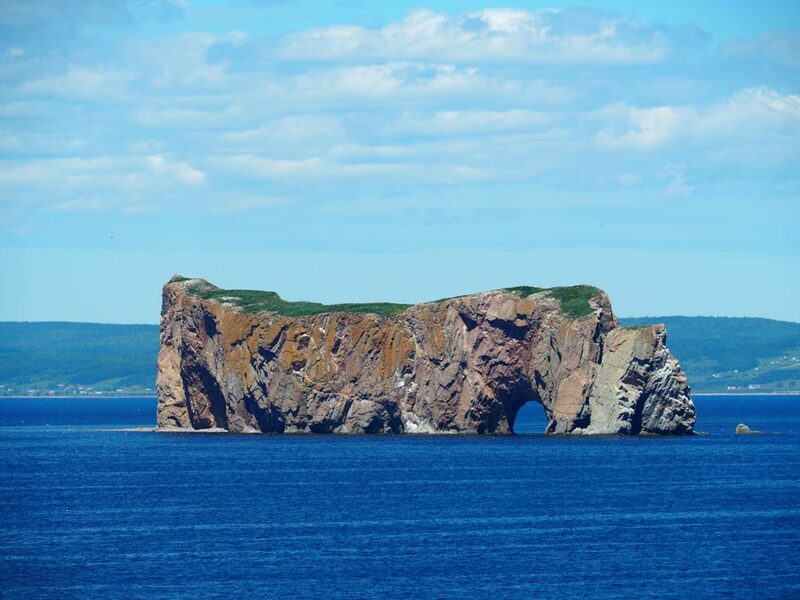 No visit to Percé is complete without a boat tour around the famous rock and a stop at L’Île-Bonaventure to hike the island’s trails and see the bird colony of 48,000 pairs of Northern gannets who come to nest on the cliffedge. On the boat ride around the island, we spotted minke whales and seals, and hundreds of seabirds nesting in the vertical rock. Before the First World War, this area was booming with the fishing industry. Fishing went into decline after the war and the entrepreneurial fishermen added benches to their boats and spawned a tourism industry by taking visitors out onto the water. A century later the boats may have changed, but tourism still has a stronghold and the boats are still getting them out for the priceless view from the water. 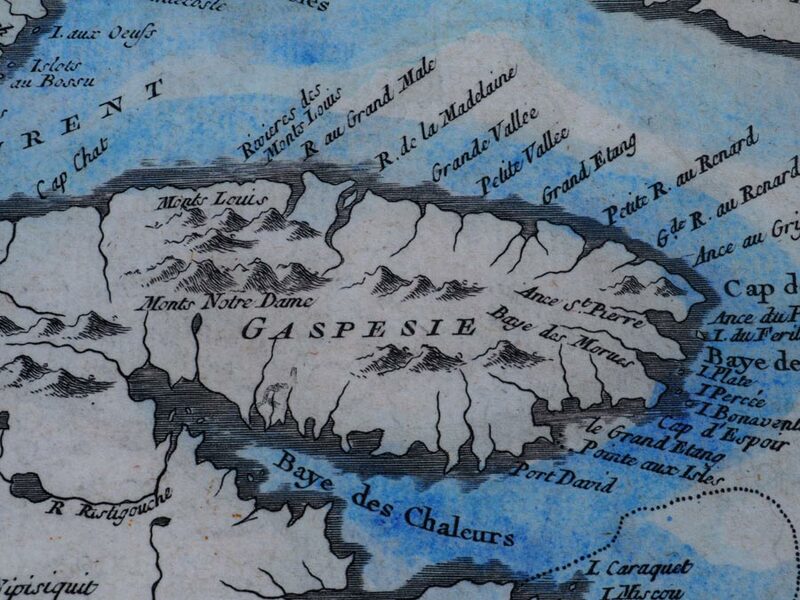 Inside the Musee de la Gaspesie, a map shows the region of the Gaspe Peninsula.